Intended as the first film in Sony Pictures’ wider Marvel Universe, the Tom Hardy-starring Venom is a desperately confused piece of work which has only a few compensatory pleasures to offer along the way. Not wishing to dish out another identikit offering of lycra-clad good guys and maniacal bad guys, Sony have taken a risk which, sadly, hasn’t quite paid off. As one of the most distinctive Spider-Man villains, on paper Venom was a smart choice to launch a wider film franchise. He looks like Spidey and does most of the things that a Spidey-like-man can, with one crucial USP. The film’s marketing campaigns have reminded more casual fans that Venom is, as his name might suggest, a villain. This offers viewers the enticing prospect of a step away from superhero clichés: a superhero film, without the hero. Crucially, Venom doesn’t involve Spider-Man in the slightest. The action all takes place in San Francisco rather than New York, where we learn that Eddie Brock (Hardy) has been exiled after upsetting former employers with his rogue brand of gonzo journalism. Things start to go from bad to worse for Eddie when he tries to take on the Elon Musk-like science billionaire Carlton Drake (Riz Ahmed). Drake has been doing some deep space exploration using his private fleet of spacecraft and, in the process, has discovered a collection of strange alien entities which he terms “symbiotes”. After bringing them back to Earth, Drake’s team discover that these creatures require an oxygen-breathing host in order to survive on the planet and Drake will stop at nothing to understand an alien race which he believes can help save mankind from a self-made extinction brought on by global warming and overpopulation. Sound a little megalomaniacal to you? Well, you’d be right, and the “crazy genius” trope is just one superhero cliché which the film circles gamely despite supposedly being cut from new cloth. Ahmed is poorly cast as an unfeeling psychopath and whilst Hardy works hard to bring his central character to life, the script seems just as confused about Brock’s character as it is with the question of what exactly Venom is meant to be. Since Brock has to ‘wear’ Venom in some capacity, the difficulty of representing interactions between the two is a constant problem. 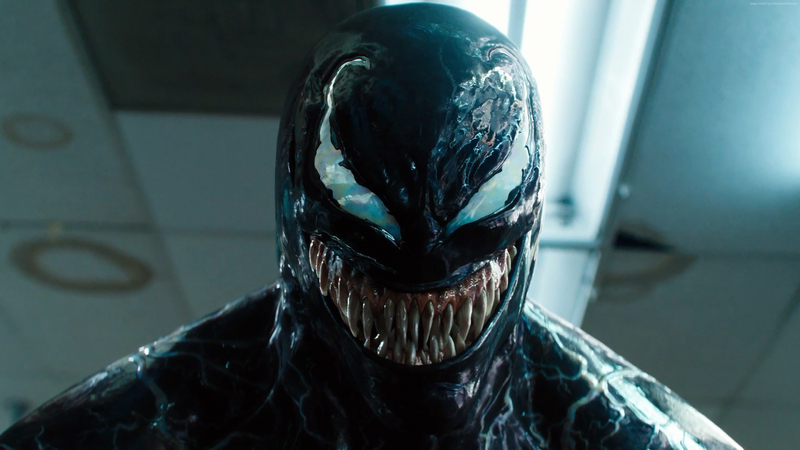 The film often resorts to Venom being voiced as an auditory hallucination – giving rise to some very feeble attempts at humour – and the script is plagued by a sense of poor internal logic and two-dimensional characters. Its greatest achievement, beyond a hard-working cast which also includes Michelle Williams as love interest Anne Weying, is the work of its SFX team who make the writhing, sprawling symbiotes look creepily beautiful.